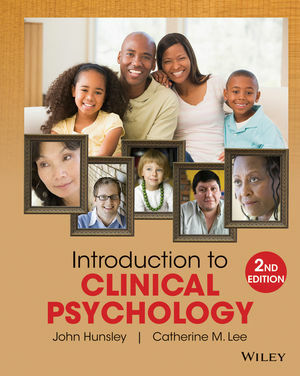 With well over half a century of experience in clinical psychology, Hunsley and Lee’s Introduction to Clinical Psychology, 2nd Edition provides clinical psychologists with an up-to-date resource that focuses on the scientific method and those clinical practices that are supported by research. This text offers important opportunities to contextualize clinical practice. Issues of diversity are examined while demonstrating how practice differs in populations of different ages. Current case studies are presented to provide a real-world perspective, while engaging Viewpoint boxes highlight fascinating and important debates. Dr John Hunsley is a Professor of Psychology at theUniversity of Ottawa. He has authored over 100 articles, chapters, and books on assessment, intervention, professional issues, and evidence-based practice. These include Scientific foundations of clinical assessment (with S. Haynes & G. Smith), A guide to assessments that work (with E. Mash), and Introduction to clinical psychology: An evidence-based perspective (with C. Lee). He is a Fellow of the Canadian Psychological Association (CPA), a Fellow of the CPA Clinical Psychology Section, and a recipient of the CPA Award for Distinguished Contributions to Education and Training in Psychology. Catherine M. Lee is Interim Dean of the Faculty of Social Sciences and Professor of Psychology at the University of Ottawa. Her research focuses on parental psychopathology, family functioning, and co-parenting. Dr. Lee is a Fellow of the Canadian Psychological Association (CPA). She is an ad hoc reviewer for many granting agencies and scholarly journals and she serves on the editorial boards of Canadian Psychology and of Cognitive and Behavioral Practice. She is the former Chair of the Clinical Section of the CPA and was President of the CPA in 2008-2009. Chapter 1 Evolution of Clinical Psychology. Chapter 2 Contemporary Clinical Psychology. Chapter 3 Classification and Diagnosis. Chapter 4 Research Methods in Clinical Psychology. Chapter 6 Assessment: Interviewing and Observation. Chapter 7 Assessment: Intellectual and Cognitive Measures. Chapter 8 Assessment: Self-Report and Projective Measures. Chapter 9 Assessment: Integration and Clinical Decision-Making. Chapter12 Intervention: Adults and Couples. Chapter 13 Intervention: Children and Adolescents. Chapter14 Intervention: Identifying Key Elements of Change. Chapter15 Health Psychology: Clinical Neuropsychology, and Forensic Psychology. Appendix 1 Major Journals Relevant to Clinical Psychology. Appendix 2 Applications to Graduate School. Chapter 1 - New updates and estimates about the economic costs of mental disorders. Chapter 2 - Updated information about the professional activities and theoretical orientations of clinical psychologists, characteristics of training programs and their graduates, accreditation standards, and registration/licensure. Chapter 3 - Information on both DSM-5 and ICD-10 diagnostic systems, along with updated information on the epidemiology of mental disorders. Chapter 4 - New Viewpoint boxes addressing how research is reported by the media and the reliability of research results. Chapters 5 to 9 - New assessment-related information, such as the continuing growth of evidence-based assessment, the updated Wechsler scales, and updated versions of frequently used self-report measures. Chapter 6 - Reorganized to help readers be better prepared for learning of the challenges in assessing client across the lifespan. Chapters 10 to 14 - New evidence of the impact of prevention programs, information on the APA’s resolution about the effectiveness of psychotherapy, an expanded listing of evidence-based treatments, details on a range of clinical practice guidelines, and results from a task force on evidence-based psychotherapy relationships. Chapter 12 and 13 - Updated information on evidence-based treatments and their efficacy for clients across the lifespan. Chapter 15 - Expanded information on the management of chronic pain and insomnia, the use of neuropsychological assessment to evaluate capacity of older adults to live independently, and updated details on forensic risk assessment tools and challenges in their interpretation. 7 new Viewpoint boxes and 11 new Profile boxes. An evidence-based approach throughout the text presents theories and practices while examining the extent to which they are supported by research. This reflects the new realities in clinical psychology and the ongoing commitment of psychologists to deliver services that are the best science has to offer. A focus on diversity and the need for sensitivity to aspects such as gender, age, or ethnicity to illustrate the importance and the challenges of professional research and practice. A lifespan perspective with examples using children, adolescents, adults, and older adults in order to guide the many undergraduate students taking an introductory course who have yet to decide the age of clients with which they would wish to work as clinical psychologists.